Many homes and out buildings are finished with plaster. Over time, plaster can crack and crumble due to weathering. Often times, paint is used to mask aging, however, older paint was not made with today’s technology and will peel leaving an unsightly appearance. One possible first step in the restoration process is to sandblast off the old paint and loose debris leaving a rough finish and a good surface for the new plaster to bond. Wire mesh can also be used as an alternative. 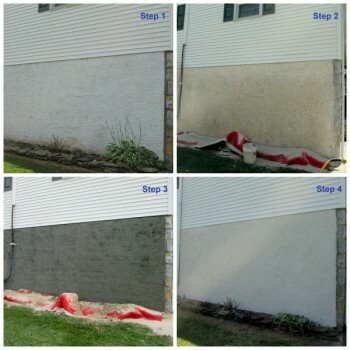 This wall was prepared by sandblasting. The final step is a finish coat. (Step 4) This can come in many colors and textures depending on personal preferences. This wall has a medium rough finish in brilliant white. Call the Get It Stoned crew for all your plaster projects.